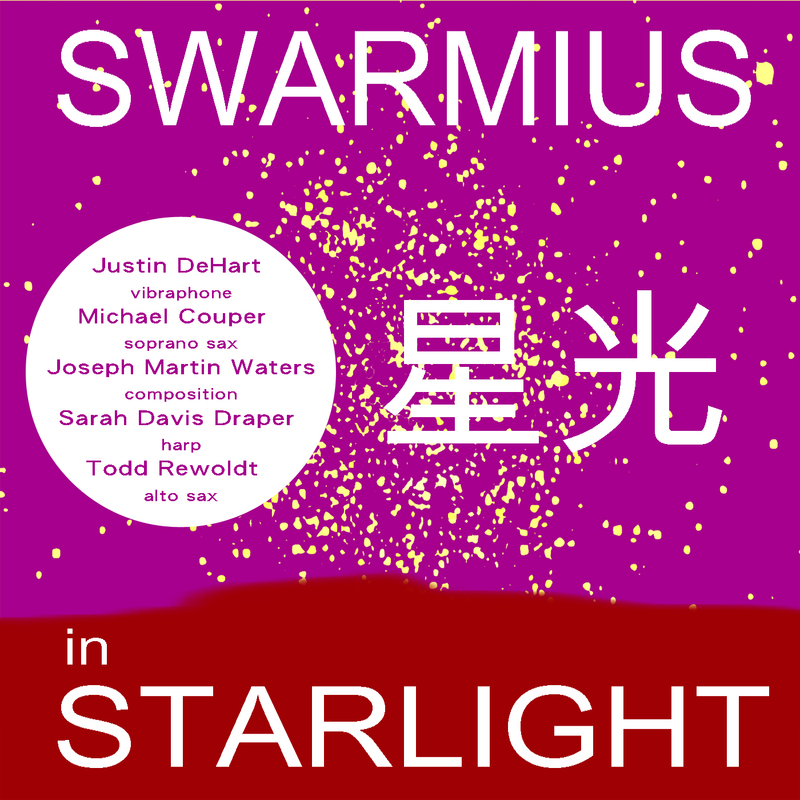 • SWARMIUS  in Starlight (2011) Aleppo Recordings, Aleppo003, featuring the SWARMIUS Ensemble: SAXIMUS (Todd Rewoldt), alto saxophone • Schrodinger's Sax (Michael Couper), soprano saxophone • Justinius LionHeart (Justin DeHart), vibraphone • Sahara (Sarah Davis Draper), harp  includes Snowflakes In Starlight • Icicles In Starlight • Aurora In Starlight, featuring Schrodinger's Sax and Justinius LionHeart •  all works composed by Joseph Waters. 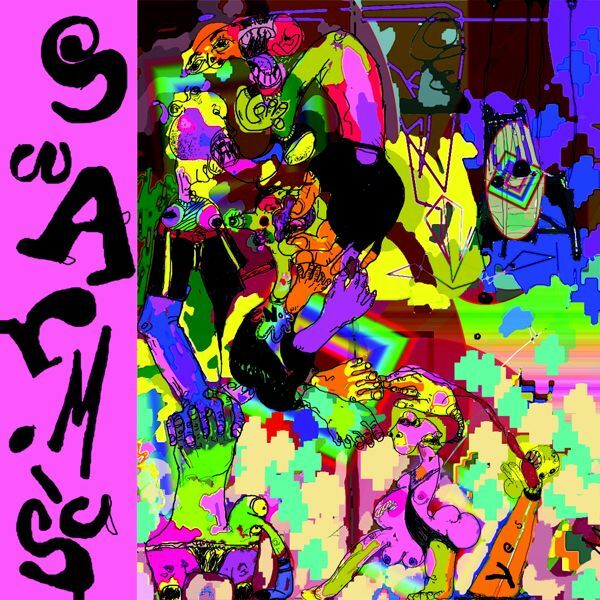 • SWARMIUS II  also normal (2010) Aleppo Recordings, Aleppo002, featuring the SWARMIUS Ensemble: SAXIMUS (aka Todd Rewoldt), alto and tenor saxophones • Fiddlus El Gato (Felix Olschofka), violin • Crotalius (Joel Bluestone), percussion • Jozefius (Joseph Waters), composer and laptop  includes Cali' Karsilama, featuring Fiddlus El Gato, SAXIMUS, Jozefius • Orpheus Is A Tip-Toed Steam Horse, featuring the ensemble • Moonlight Beach Chaconne (The Beach Boys, J.S. Bach and Stevie Wonder Take A Trip To Nigeria, Where They Encounter The Ghost Of Richard Wagner, Impersonating A Shaman), featuring Fiddlus El Gato, with SAXIMUS, Crotalius, Jozefius • Grand Larceny, featuring the ensemble • Anonymous, featuring the ensemble  all works composed by Joseph Waters. 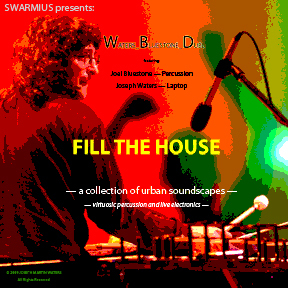 • SWARMIUS presents Waters_Bluestone_Duel  Fill The House (2010) Aleppo Recordings, VOIC002, a collection of urban soundscapes  virtuosic percussion and live electronics, featuring Joel Bluestone (percussionist with SWARMIUS Ensemble) and Joseph Waters, laptop, • Flame Head (2007) (Chinese opera gongs and vibraphone) • Air  Part 1 (2004) (marimba) • Earth (2009) (box, vibraphone, timpani, gongs, glockenspiel, crotales) • Heart (2007) (bowed vibraphone, tubular bells, timpani, thunder sheet, glockenspiel, piezo scratch) • Air  Part 2 (2008) (vibraphone, crotales) • Fire  Part 1 (2008) (metal pecussion) • Air  Part 3 (2004) (timpani, glockenspiel, vibraphone, tubular bells, crotales)  all works composed by Joseph Waters. 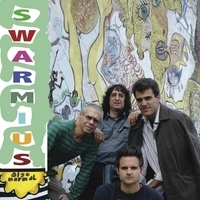 • SWARMIUS (2008) Aleppo Recordings, VOIC001, featuring the SWARMIUS Ensemble: Todd Rewoldt, alto and tenor saxophone • Felix Olschofka, violin • Joel Bluestone, percussion • Joseph Waters, composer and laptop  includes Intelligent Designs (2007), featuring Felix Olschofka, Todd Rewoldt, Joseph Waters (12.02), Vivaldi Fireflies (2007) featuring Felix Olschofka and Joseph Waters (12.24), Labyrinth of Leaves (2007) featuring Todd Rewoldt, with fixed electronic media (11.29), Flame Head (2007) featuring Joel Bluestone (Chinese opera gongs and vibraphone) and Joseph Waters, laptop (10.01), Lucas the Bringer of Light (2007) featuring Felix Olschofka, Todd Rewoldt, Joel Bluestone (vibraphone) and Joseph Waters (18.37)  all works composed by Joseph Waters. 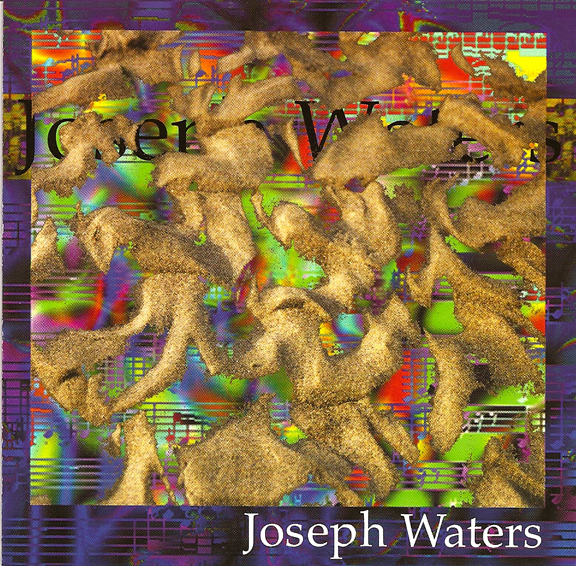 • Joseph Waters  Early Morning (2001) North Pacific Music, NPM LD 009  includes Arabesque (1976), piano solo, featuring Susan Dewitt Smith  piano (1.35), When The Clouds So Boldly Painted on the Sky (1997), koto and live electronics, featuring Liz Falconer  koto (10.02), Sulphur-Crested Cockatoos (1998), SATB and Wind Sextet, featuring LeAnne DenBeste, soprano • Sue Hale, mezzo sprano • Scott Tuomi, tenor • Craig Kingbury, bass • Nancy Teskey, flute • Allen Juza, english horn • Betsy Hornick, clarinet • David Becker, bassoon • Kevin Clavert, horn • Jim O’Banion, trumpet (8.54), Drum Ride (1991–99), piano and electronics, featuring Susan Dewitt Smith  piano (10.45), Quiet Music  Early Morning (1998), string trio, featuring Ron Blessinger, violin • Brian Quincy, viola • Phil Hansen, cello (11.14), The Garden of Kali (2000) digital electronics derived from samples of prepared piano, featuring Jeffrey Payne, piano (10.23), The Populist Manifesto (1984–99), soprano and mixed chamber ensemble, featuring Brenda Baker, soprano • Gernot Blume, accordion • Tom Bergeron, saxophones • John Hubbard, cello • Julie Spencer, percussion (15.43)  all works composed by Joseph Waters. • Offshore (2006) Albany Records, TROY813, featuring the Bakken Trio, Todd Kuhns, Ron Blessinger, Susan Smith & Philip Hansen, includes Ocean Eyes (2005), for clarinet, cello, piano and live electronics, featuring Todd Kuhns, clarinet • Ron Blessinger, violin • Philip Hansen, cello • Susan Dewitt Smith, piano, and Joseph Waters, laptop (12.12), Witches of the Unconscious  Son Clave (2006) (aka The Roaring of the Moon, see below under Bakken Trio) for violin, cello, piano and live electronics, commissioned by and featuring The Bakken Trio: Stephanie Arado, violin • Katja Linfield, cello • Judy Lin, piano (14.14), Ghosts of the Evening Tides (2005) for vioiln, cello, piano and live electronics, featuring The Bakken Trio (8.40), Aloilloi, Pakuikui (2005) for vioiln, cello, piano and live electronics, featuring The Bakken Trio (8.30), Kanashibari (2003) cello and live electronics, featuring ; Philip Hansen, cello • Joseph Waters,laptop (14.25), Loneliness of the Sun (2005) for vioiln, cello, piano and live electronics, featuring The Bakken Trio (8.15)  all works composed by Joseph Waters. • The Bakken Trio (2006) featuring the Bakken Trio perorming works by Brooks, Takemitsu, Waters  includes Desert Island Pieces (Ruminations on a Troubled Planet): I. The Loneliness of the Sun (8.14), II. Aloilloi, Pakuikui  the Fast Shallows (8.30), III. Ghosts of the Evening Tides (8.42), IV. 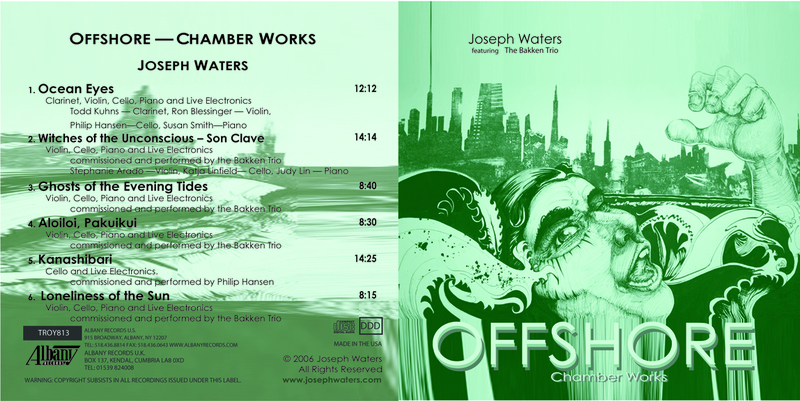 The Roaring of the Moon (14.00) by Joseph Waters (NOTE: These are the original, more acoustic versions of some of the works listed above on Offshore). Desert Island Pieces (Ruminations on a Troubled Planet) was commissioned by The Bakken Trio: Stephanie Arado, violin • Katja Linfield, cello • Judy Lin, piano. • Alejandro Escuer: Aqua  Musica para flauta y electronica (2002) Quindecim Recordings, QP091. 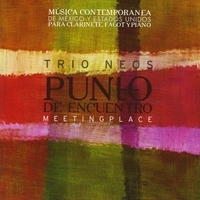 Various Artists commissioned by Alejandro Escuer, includes Dream in Aqua & Scarlet (9.00), for flute and fixed electronic media, by Joseph Waters. 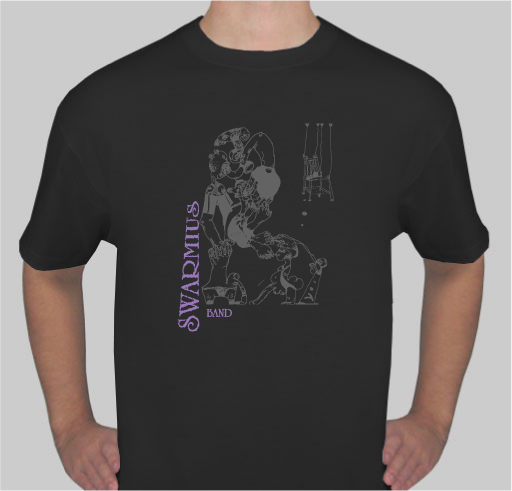 • Playerless Pianos (2005) North Pacific Music, NDM LP 007  Seventh Species Composers Series, Various Artists collection, includes Counterpoint Studies: Trochilidae, Variations on a Bebop Theme, Counterpoint in F by Joseph Waters.